6abc Action News / YouTubeThe Phillie Phanatic fired an errant shot from his hot dog cannon on Monday, accidentally injuring Phillies fan Kathy McVay. The Phillie Phanatic accidentally injured Phillies fan Kathy McVay on Monday night when an errant shot from a hot dog cannon struck her in the face. McVay suffered a black eye and was taken to the hospital to check for a concussion, but has since been in high spirits about the situation. The Phillies have reached out to invite McVay to another game when she’s ready to return to Citizen’s Bank Park. Baseball mascots are charged with the important task of entertaining and hyping up the crowd between innings, and creating a joyful mood at the stadium regardless of the score. But on Monday as the Phillies hosted the St. Louis Cardinals, that task went horribly awry for the Phillie Phanatic. Wielding his ceremonial hot dog cannon, the Phanatic fired a shot and accidentally injured Phillies fan Kathy McVay when an errant hot dog hit her right between the eyes. McVay suffered a black eye, and was taken to the hospital to ensure she hadn’t suffered a concussion. Despite the situation, McVay has had a good attitude about the series of unfortunate events, and does not plan to take legal action against the franchise. She also openly acknowledged that the story is, apart from her injury, kind of funny. She also had a message for Phillies fans heading to games. “Just to be aware because you never know. I understand a baseball, but not a hot dog,” she said with a laugh. 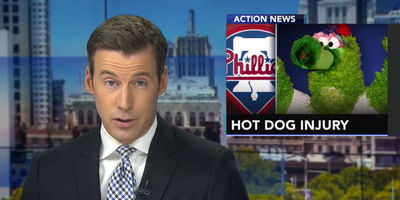 According to 6 ABC’s report, a spokesman said that the Phanatic feels terrible about the whole ordeal, and the Phillies organisation has reached out to invite McVay to a game when she is ready to return to the ballpark.